Italian painter in the late Mannerist style, known from a number of religious paintings; active in northern Sicily (1615-1630). Birth of St John the Baptist (1619), Francesco Quaraisima (op. 1615-1630). Termini Imerese (Sicily): Museo Civico “Baldassare Romano”. Ref. Website: Termini Imerese, Museo Civico; Anthony Rowland-Jones (pers. com., 2000). At the top left a young angel plays a small pipe (insufficient detail to identify further) with (older) angels playing lute, viola (held across the chest) and portative organ. One sings from music book. Another version of this painting is in the church of S. Maria degli Angeli in Caccamo. Dutch painter, draughtsman and engraver; his paintings include groups of elegant people, scenes with soldiers, surgical operations and tavern scenes with peasants and beggars, whose postures and faces approach caricature; the scenes, usually on small panels, are heavily and powerfully rendered in warm shades of brown, set off by strong local colouring in the principal figures; his peasant scenes are characterized by the use of strong chiaroscuro and a gentle, harmonious palette; born Amsterdam (1605/6), died Amsterdam (1647). Comedians Dancing (ca 1635), oil on panel 40.3 × 53.3 cm, Pieter Quast (1605/6 – 1647). Paris: Comédie Française, Bibliothèque-musée. Ref. Nash (1972: fig. 63); Bridgeman Art Library (2009: Image XIR181855). Three Comedia dell’ Arte Figures dance: one strums a lute, another plays a narrow flared bell recorder; two gentlemen and a lady look on. Interior with Boers Smoking, Drinking and Playing Music (1643), oil on panel, 35.0 × 28.8 cm, Pieter Quast (1605/6 – 1647). London: Sotheby’s, Sale W02807, Old Master Paintings, 9 July 2002, Lot 359. Ref. Rijksbureau voor Kunsthistoriche Documentatie 107491 (2010-col.) Three peasants sit around a low table. One smokes a clay pipe; a second drinks from a clay jug; and a third plays a slender pipe with a rapidly flared bell, possibly a recorder, but there is insufficient detail. The greatest Flemish sculptor of the Baroque; directed the sumptuous decoration of the Amsterdam Stadhuis (Town Hall), now Koninklijk Paleis; born Antwerp (1609), died Antwerp (1668); son of Erasmus Quellinus (ca 1584-1640); cousin of Artus II Quellin (1625-1770) with whom he collaborated. Allegory of Music, carved wood sculpture, Artus I Quellinus (1609-1668). Amsterdam: Nieuwe Kerk, on top of the positive organ case. Ref. Postcard: Art Unlimted, Amsterdam A9455 (2001 – col.); Liesbeth van der Sluijs (pers. comm., 2001); Anthony Rowland-Jones (pers. comm., 2001). Two figures recline surrounded by musical instruments which include lyre, ? shawm, violin, tambourine (with jingles), viol, cornetto, and a recorder. On the left a bird with a reptilian looking head perches with outstretched wings. The organ is by German van Hagerbeer, with additions designed by Jacob van Campen (1655). Amsterdam, carved wood sculpture, Artus I Quellinus (1609-1668). Detail. Amsterdam: Nieuwe Kerk, lampet immediately beneath the Rugpositief organ case. Ref. Postcard (2001); Liesbeth van der Sluijs (pers. comm., 2001); Anthony Rowland-Jones (pers. comm., 2001); Website: Elly Kooiman (2014-col.). Around a central female figure with outstretched wings putti gambol playing cymbals, tambourine, a flute and a small flared-bell pipe (possibly a recorder). 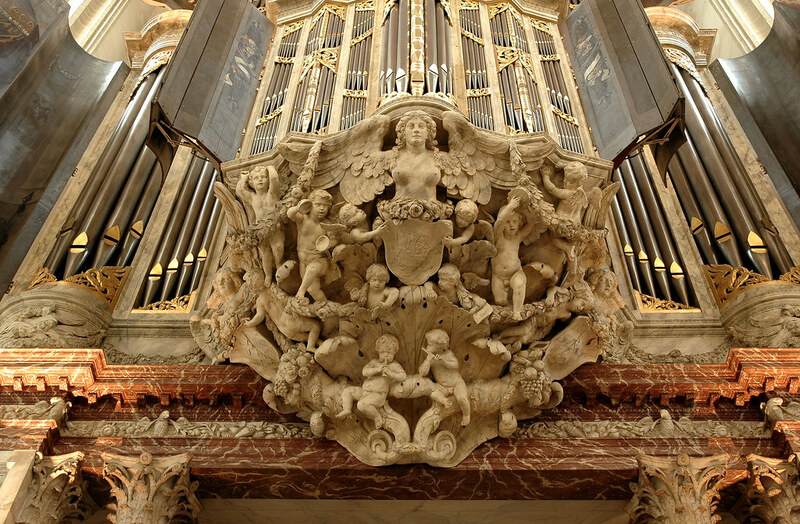 The organ is by German van Hagerbeer, with additions designed by Jacob van Campen (1655). Putti with Musical Instruments, carved marble pillar, Artus I Quellinus (1609-1668). Amsterdam: Nieuwe Kerk, left-hand pillar beneath the main organ. Ref. Website: Elly Kooiman (2014-col.) Elongate trophy comprising putti and musical instruments. Amongst the latter are a lyre, a guitar (with a carved head atop the pegbox), a syrinx, a violin, lute, cornetto, trumpet and the foot of what appears to be a baroque recorder but could equally well represent that of a shawm or oboe. On the opposing right-hand pillar, putti clamber over a harp, two violins, ?cittern, syrinx, lute, mute cornett and shawm. Trophy, marble relief under the statue of the god Apollo (1651), Artus I Quellinus (1609-1668). Amsterdam: Stadhuis (Town Hall), now Koninklijk Paleis (Royal Palace), South-West Gallery. Ref. Goosens (1996: 51, pl. 42 – b&w); Liesbeth van der Sluis (pers. comm., 2003); Website: Google Cultural Institute (2015-col.) A trophy of musical instruments including lyre, violin, viola, flutes, cornetto, shawm, guitar, lute, harp, bagpipe, syrinx and a bundle of seven recorders. Two of the latter have only the heads visible: one is viewed from the rear with a clearly depicted beak, windway and thumb hole; the other is viewed from the side with a clearly depicted beak and window/labium. A third recorder has only the body and foot visible, the lowermost finger hole offset. Only the feet of the remaining four are visible. A celestial globe is also depicted, along with an armillary sphere, sheet music, anatomical and botanical drawings and laurel wreaths. A celestial globe and armillary sphere allude to Apollo as the sun god driving his chariot across the sky from east to west, while the musical instruments and sheet music refer to his role as the god of music, poetry and art. Putti with Musical Instruments, carved marble relief, Artus I Quellinus (1609-1668). Amsterdam: Stadhuis (Town Hall), now Koninklijk Paleis (Royal Palace), decorating the fireplace on the north wall of the Council Chamber. Ref. Janssen (1953: 77 – b&w); Goosens (1996: 77, pl. 75 – b&w); Liesbeth van der Sluis (pers. comm., 2003). Putti sing and play lyre, harp, flute and two play small recorders (the window/labium and off-set lowermost finger hole of one clearly depicted) – one cylindrical, the other flared. 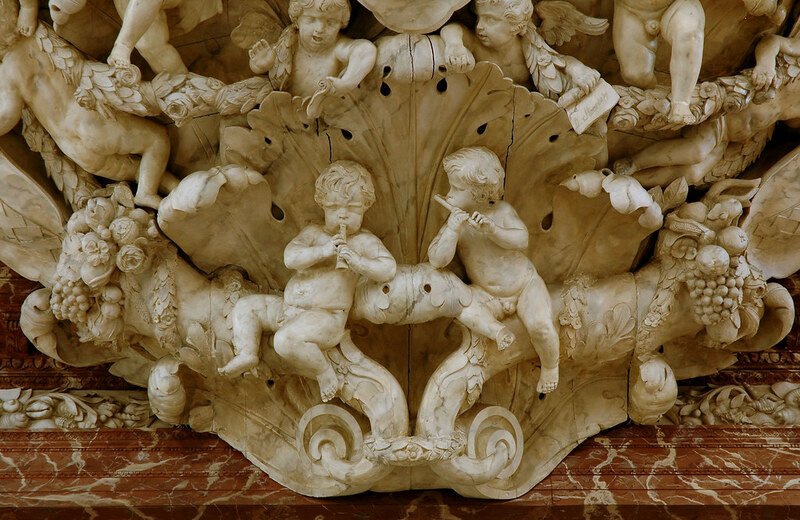 A third putto plays a flared-bell pipe (probably another recorder). Flemish painter and draughtsman who executed numerous altarpieces depicting Counter-Reformation themes for churches and monasteries throughout the Southern Netherlands, as well as secular paintings that depict scenes from ancient history and mythology and allegorical compositions; perhaps best known for his work for Rubens during the 1630s; born Antwerp (1607), died Antwerp (1678); son of the sculptor Erasmus Quellinus (ca 1584-1640). Trophies with Musical Instruments (1654-1658), carved wood, designed by Erasmus Quellinus (1607-1678). Antwerp: St Paulus Kerk, organ case decoration. Ref. Peeters & Vente (1984: 233-col.); Arnold den Teuling (pers. comm., 2002). The carpenter who made the case was Pieter Verbruggen de Oude (1615-1686). Due to guild regulations the carvings must have been made by a member of the sculptor’s guild, so the wood carving itself is probably anonymous. The organ dates from 1654-1658 and was built by Nicolaes van Haeghen, who also built an organ in the Grote Kerk, Dordrecht (1671). Trophies below the diapasons at the front of the organ include viol and shawm (left), drum and a tenor-sized, flared-bell recorder (centre) and lute. Bacchantes (1640-1650), etching, 23.5 × 29.6 cm, Erasmus Quellinus (ca 1584-1640). London: British Museum, Inv. S.5327. Ref. Website: The British Museum (2012-b&w). Three putti and a young satyr dance beneath the trees accompanied by, a satyr playing a recorder and a putto on tambourine (with jingle rings). The recorder is clearly depicted with details of the window/labium and finger holes visible. Flemish painter, engraver, cartoonist, and ? sculptor; born 1619, died 1688; son of the sculptor Erasmus Quellinus (ca 1584-1640). Mercury and Argus (1652), carved marble relief after Artus Quellinus I (1609-1668), by Hubertus Quellinus (1619 – 1688). Amsterdam: Stadhuis (Town Hall), now Koninklijk Paleis (Royal Palace), above the entrance to the former Burgomasters’ Cabinet. Ref. Goossens (1996: 73, pl. 69 – b&w); Warburg Institute, London (2000); Liesbeth van der Sluis (pers. comm., 2003). Artus Quellinus’ picture was published in Secunda Pars praeciuarum effigierum, Amsterdam (1668). A very muscular-looking Argus in a loin cloth leans wearily on his staff, his back to a tree, his dog at his feet. Mercury (in winged helmet and sandals) is seated before him, his caduceus on the ground at his feet, his sword ready at his side. Mercury holds a small markedly flared-bell recorder awkwardly over his shoulder rather than playing it. Behind them, Io (as a heifer) looks vacantly into the distance. Prominently in the foreground is a fleshy-leaved herb, probably meant to be the mercurialis of the Romans, possibly the garden weed and medicinal herb we know as Mercurialis annua (‘Dog Wort’). Also in the foreground is a small lizard which has, of course, magical connotations (a favourite ingredient in witch’s brew). This carving bears a striking resemblance to an anonymous 16th-century engraving of the Nuremberg School, though in that illustration the construction is the reverse of that here and Mercury is shown actually playing his recorder. Mercury and Argus (ca 1675), oil on canvas, 139 × 137 cm, English School, after an engraving by Hubertus Quellinus (1619- 1688). Newport: Tredegar House. This scene is taken from Ovid’s Metamorphoses. One of Jupiter’s many loves was Io, a princess of Argos. When this was discovered by his wife, Juno, she turned Io into a white heifer and handed the animal over to the hundred-eyed giant, Argus, to guard. Mercury was sent by Jupiter to kill the giant, which he did after first lulling him to sleep with music. Here, Mercury is about to play his soprano-sized hand-fluyt to Argus who stands before him, leaning on his staff. German printer and wood-engraver active in Cologne; active 1478-1506. David Brings the Ark to Jerusalem (1478-1480), woodcut, Heinrich Quentel (fl. 1478-1506). Durham: Cathedral Library, Inv. 14a, f.145v. Ref. Remnant (1981: 200, fig. 184); Bridgeman Art Library (2003: Image STC67513 – col.) One of a number of woodcuts used in Quentel’s Low German Bibles of 1478-1480, and re-used in the Biblia Germanica printed at Nuremberg by Anton Koberger (1483). The Ark of the Covenant is dragged on a cart pulled by two horses in front of which walk musicians, the first two of whom play harp and a slightly flared duct flute the window/labium and seven finger holes of which are clearly depicted. The position of the thumb of the uppermost (left) hand is held off the instrument, possibly indicating the presence of the thumb hole characteristic of the recorder.